One of the things Northwest Michigan is known for is its wines. 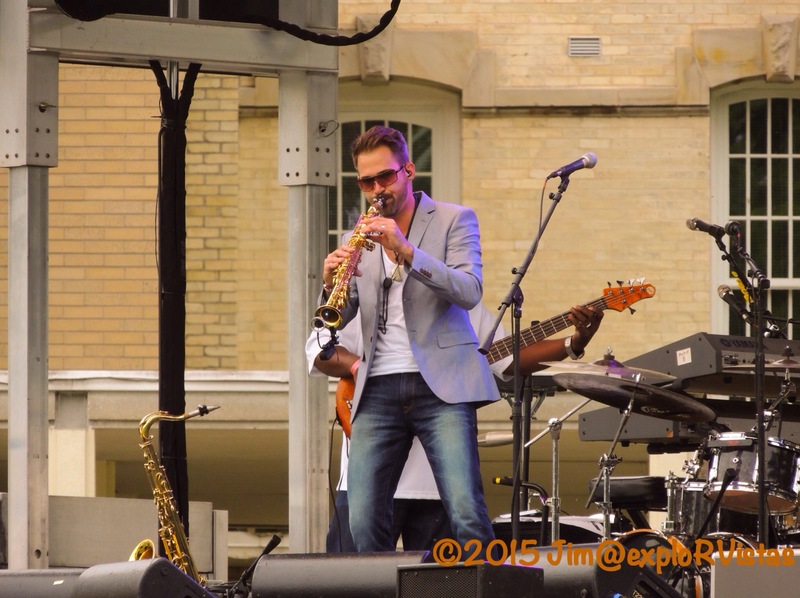 On Saturday, we were fortunate to be able to spend the afternoon at the Traverse City Wine and Art Festival. A friend of ours who works with one of the local vintner’s associations, helped us to secure tickets. Thank you, Camilla! 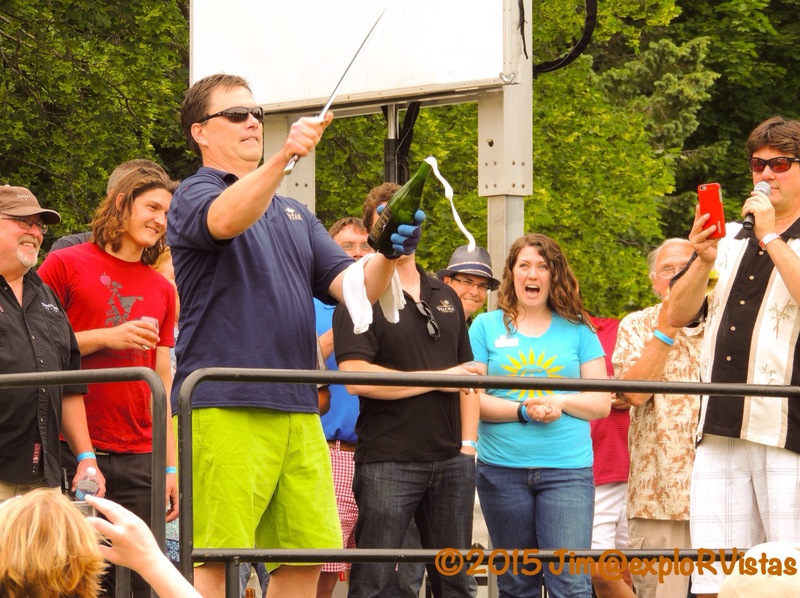 The annual festival is a combination of wine tasting and education, local gourmet foods, area artists, and music. One of the bands on this year’s slate was The Verve Pipe, an alternative rock band that is fairly well known. On the way into the event, we saw this cute, little Airstream trailer. 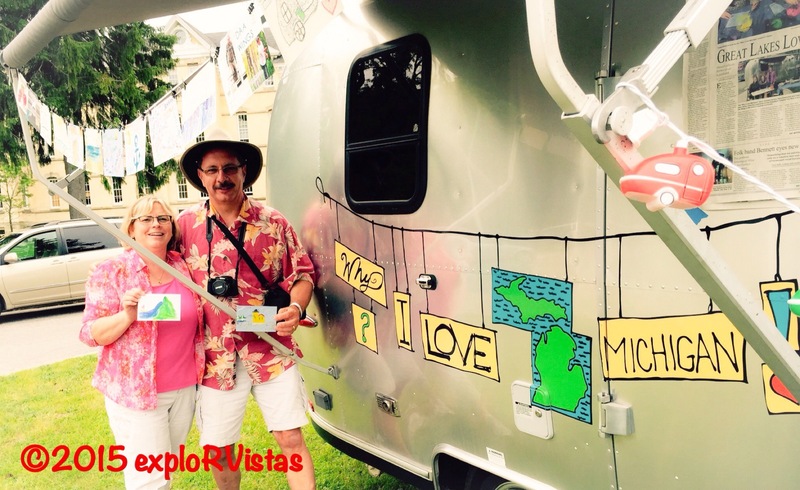 There were three young women there who have been traveling around the state to different festivals, collecting postcards created by people on why they love Michigan. Diana created a lakeshore scene, and I did my best to recreate Old Mackinac Point Lighthouse, which my great-grandfather built. They will be displayed along with thousands more at a large art exhibit to be announced later. 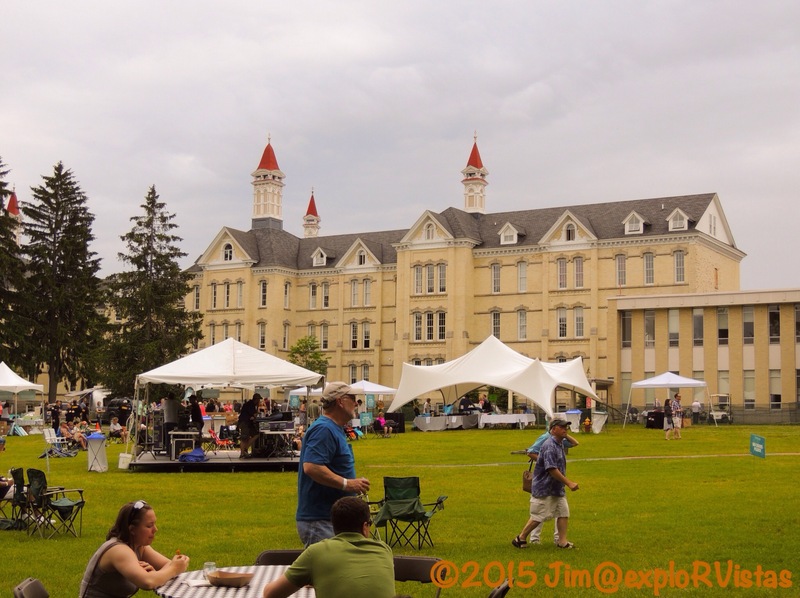 The event was held at the Grand Traverse Commons, formerly the Traverse City State Hospital. This sprawling complex, built in 1884, was one of three psychiatric institutions in the state. When it closed in the 1980’s, it appeared to be headed for the wrecking ball. Local visionaries took over and turned it into a conglomeration of shops, coffee houses, restaurants and such. Talk about repurposing something! There was a good crowd at the festival, right from the start. As the afternoon headed towards evening, even more people streamed in. 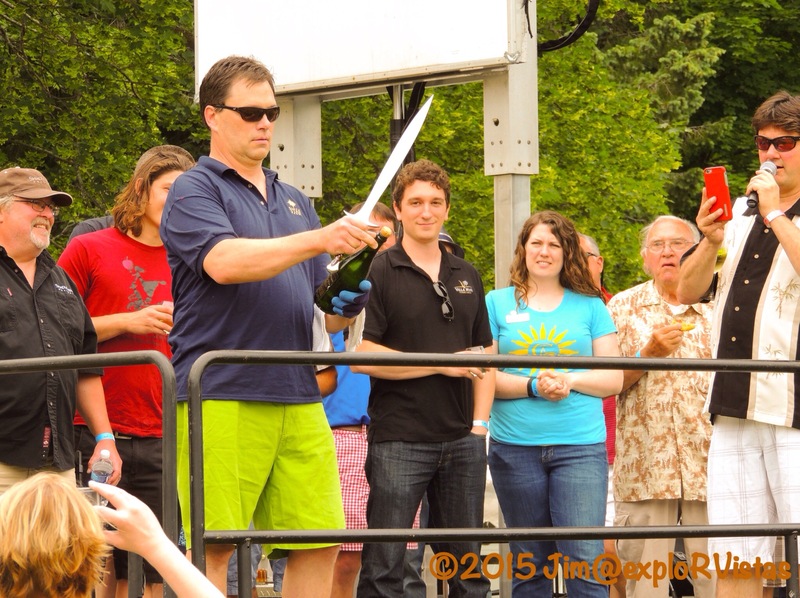 Lee Lutes, head winemaker at Black Star Farms, had the honor of kicking off the festival with a champagne saberage, basically opening the bottle with a saber. He was surrounded by fellow winemakers from the region. 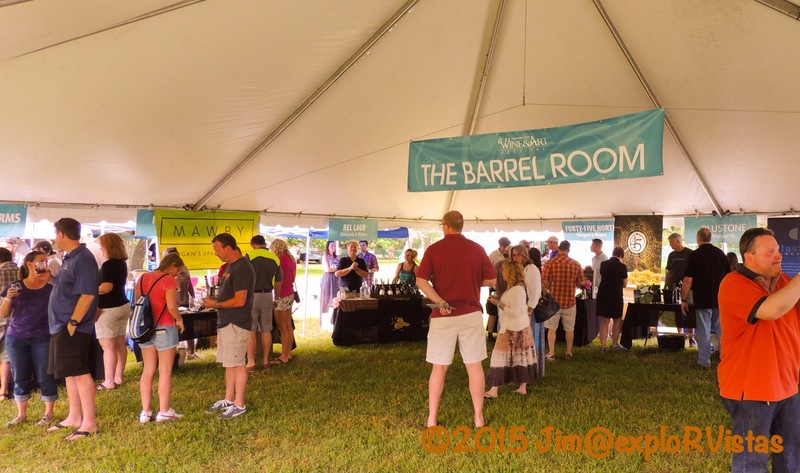 There were three large tents with local wineries represented. Our tickets included four free wine pours each, with additional pours available for purchase. Another tent was dedicated to wine education. There were several artists practicing their crafts at the event. We spoke with a few of them about their work. 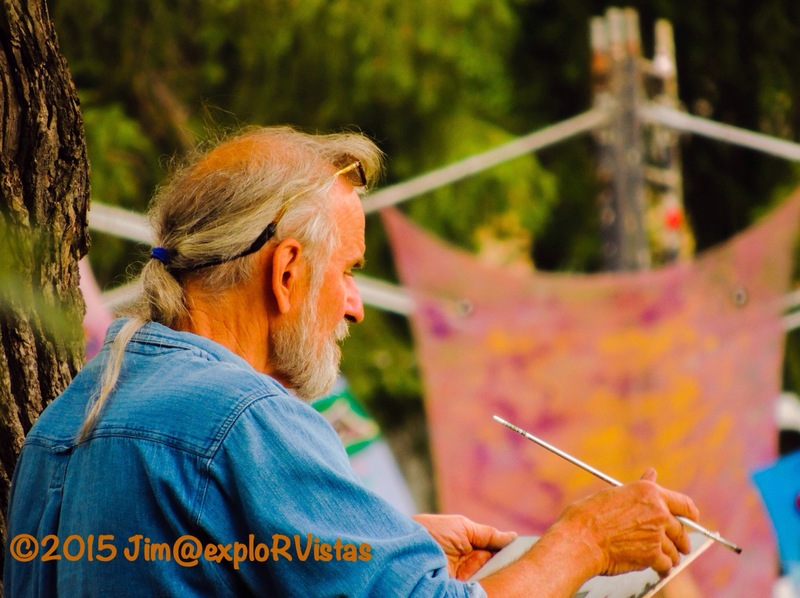 It is interesting to hear how they view their subjects and how they convey those images through their artistry. It was great to have all of these artists and vintners in one location. 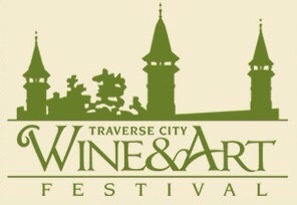 If you happen to be in the area next summer, we highly recommend attending the Traverse City Wine and Art Festival. If you can’t make it, try to catch a wine trail event, as they are all very well done and are always a lot of fun. They are held throughout the year. You won’t be disappointed! Hope you two are safe and the weather wasn’t bad in your area. Take care! Thanks for the pics. I missed some areas. Glad you could join this event. Loved the expressions on the faces at the saberage. :). Thanks again! 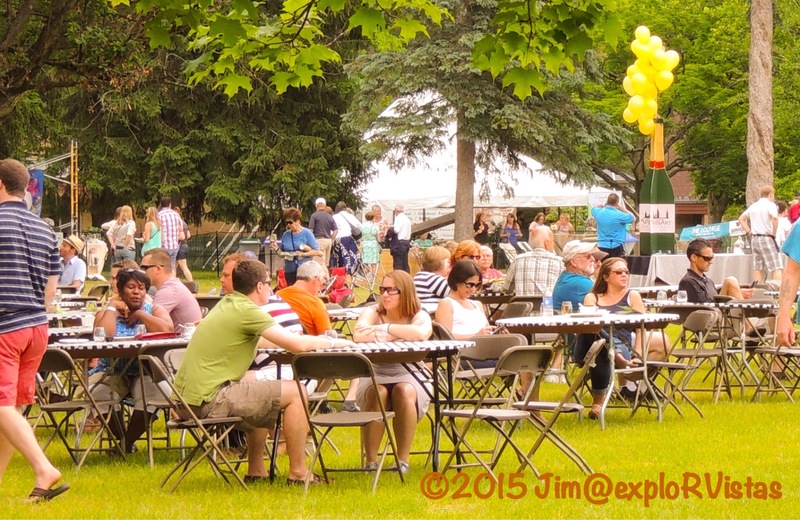 A wine festival – can it be any better?? 🙂 I love the post card idea of the two ladies in the Airstream trailer. And their trailer also looks very cool:) Hope you enjoyed some good wine! Michigan wines are pretty good, especially the whites, Inger. The Reds are getting better every year. Jim, I have been negligent in letting you and Diana know how much I enjoy reading your blog. Keep up the good work, and hope to see you again somewhere down the road! Thanks, Jo! So sorry about all the issues you guys are having with Baby Girl. Hopefully all works out well. See you on the road somewhere, for sure!